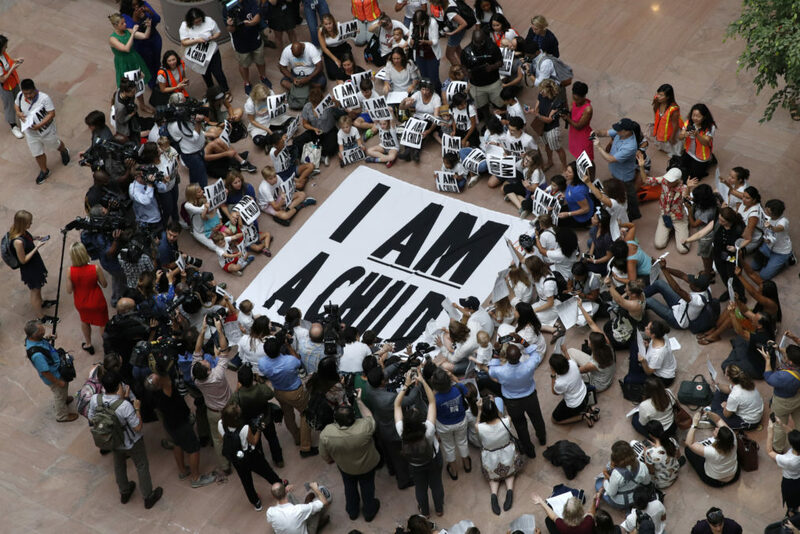 Families with young children protest the separation of immigrant families with a sit-in at the Hart Senate Office Building, Thursday, July 26, 2018, on Capitol Hill in Washington. At the time, the Trump administration faced a court-imposed deadline to reunite thousands of children and parents who were forcibly separated at the U.S.-Mexico border, an enormous logistical task brought on by its "zero tolerance" policy on illegal entry. The federal government is seeking to end court oversight of how it treats immigrant children, more than 20 years after a landmark lawsuit over mistreatment of children in the nation’s immigration system. The proposal to end a judge’s oversight of the Flores agreement, as it’s known, comes as federal officials report that more than 500 immigrant children remain separated from their parents in the wake of President Donald Trump’s “zero-tolerance” policy. In a news conference Friday, child detention experts and a lawyer from the Flores legal team raised concerns that the administration’s new regulations could overturn fundamental standards of care required in the federal agreement. The settlement, agreed to in 1997, requires the government to provide certain housing and nutritional requirements to immigrant children. It also mandates the release of those children to relatives or other known family friends within a timely manner. Last week, the Office of Management and Budget concluded its review of two regulations filed by the Department of Homeland Security and Department of Health and Human Services. The Department of Homeland Secuirty proposal seeks to “enable the U.S. Government to seek termination of the (Flores agreement) and litigation concerning its enforcement. Through this rule, ICE will create a pathway to ensure the humane detention of family units while satisfying the goals of the FSA,” an abstract of the rule reads. The second proposal aims at codifying parts of the Flores agreement into law. The Washington Post recently obtained a draft detailing the administration’s plans to replace Flores. Based on that story, the new provisions may include removing restrictions on family detention and eliminating licensing requirements, said Heidi Altman, director of policy at the National Immigrant Justice Center. It’s unclear when the regulations would become official. The two rules will be published in the Federal Register for a comment period before they are finalized by the agencies. Holly Cooper, a lawyer on the Flores team, said the regulations raise concerns, particularly because the government “has historically not complied with the minimal protections” in the agreement. If the rules diminish the care of immigrant children, there could be legal recourse, added Cooper, who is also the co-director of the Immigration Law Clinic at the University of California, Davis. “Any legal challenges could be brought if they don’t comply with the Constitution or the spirit of the Flores settlement agreement,” she said. The government’s proposed regulations were filed on the heels of the Trump administration’s policy used to separate about 2,600 migrant children from their parents at the U.S.-Mexico border this summer. The government has since ended this policy and is now in the process of reuniting the families. On Thursday, Department of Justice attorneys released new reunification numbers: 528 children remain separated from their parents. Of those, 23 are under the age of 5. Nearly 140 parents also waived their rights to reunification, but ACLU lawyers argue that many were coerced to sign forms they didn’t understand. About 18 months ago, lawyers made filings in the case alleging that the government was violating the agreement. Among the claims: Unaccompanied minors at Shiloh Treatment Center were being injected with psychiatric drugs without proper consent. On July 30, U.S. District Judge Dolly Gee ordered the government to stop drugging the children without the consent of a parent, a court order, or without following Texas law on administering such drugs on an emergency basis. A recent Reveal investigation detailed a long pattern of problems at Shiloh and companion facilities operated by the same person, Clay Dean Hill. Three children died at the facilities after being restrained by workers and others alleged sexual and physical abuse. Several state reports also singled out the facilities for improper use of drugs. Have a news tip related to immigration for Reveal? Send it to border@revealnews.org. Laura C. Morel can be reached at lmorel@revealnews.org. Follow her on Twitter: @lauracmorel. Our reporters are digging up new info on Trump’s family separation policies all the time. Sign up to get our latest stories delivered to you.